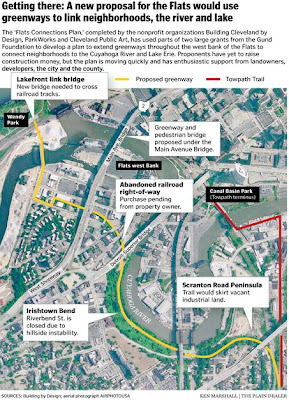 A recent article posted by Steven Litt, Architecture Critic for the Cleveland.com blog, outlines the latest plan to rehabilitate The Flats area near downtown Cleveland, including hiking and biking trails, and that elusive final stretch to the shore of Lake Erie for the Towpath Trail. Read the whole article here. Maybe one day we'll be able to connect coast-to-coast on dedicated trails. I know there are communities like ours out there connecting up the links. If you would like to read about what the City of Eugene, Oregon is doing email: peoplepower@ci.eugene.or.us for a subscription to InMotion newsletter. It's amazing what can be done if we share our ideas!